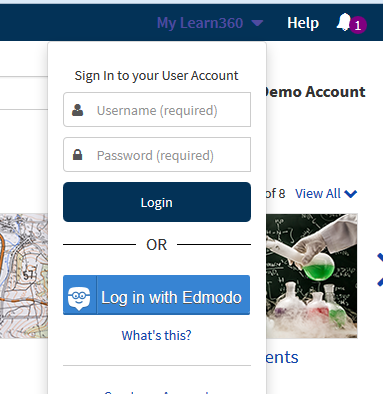 Users have the ability to link their Edmodo account with their Learn360 user account. Linking accounts allows for one-click login access to the platform using the "Log in with Edmodo" button on all subsequent requests. This is a one time, optional feature that can be disabled at the account level within the admin portal. Log in with Edmodo is offered as a FREE service. Edmodo is only available for Learn360. By default, this integration is disabled. To enable or disable this feature for your accounts, please consult the permitted partner apps help article. Assuming this feature is enabled for your account, the below steps outline how to link your Edmodo account to a platform user account. 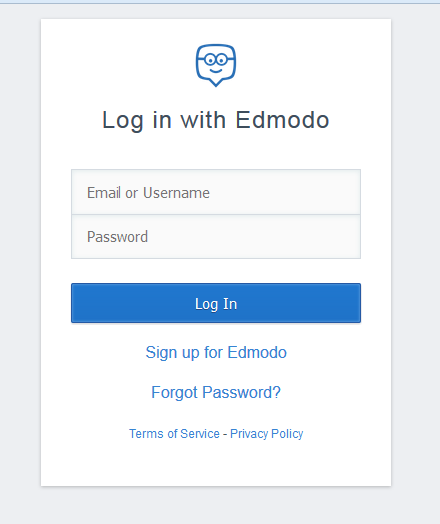 You will find the Log in with Edmodo button on your main login page if you are using your accounts authenticated URL, or from the My Menu if you are logged in with a general user. To link your account, click on the Log in with Edmodo button. You will be redirected to the Edmodo login page where you will need to enter your Edmodo username and password. 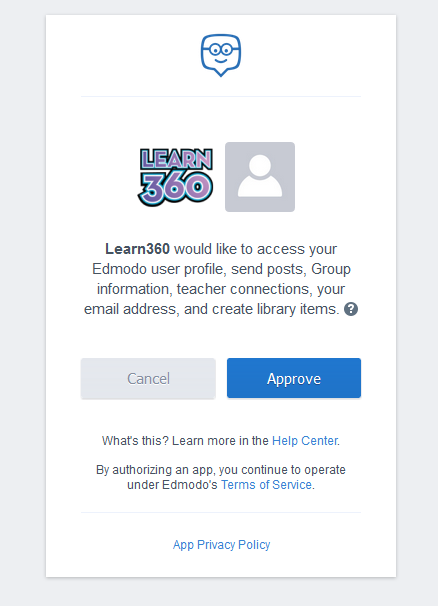 Once you have entered your Edmodo account, you will be redirected to a permissions page asking you to approve the sharing of information between Edmodo and Learn360. Once you hit Approve, you will now be redirected to the Learn360 account linkage page as shown below. This is the final step of the account linking process and you will only see this during the initial setup process. 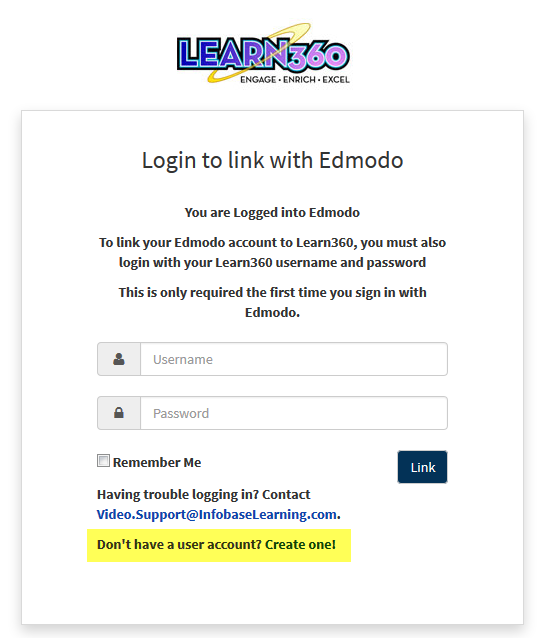 If you do not have a Learn360 user account, you may use the link at the bottom of this login box to create a new one and complete the linking process. This option is only available when using the authenticated URL or a general user account. After you have entered a valid username and password, click the Link button to complete the process. You should now be logged into Learn360. You may confirm the account linkage by visiting you Profile page and looking under the Connected Partner Apps section. If the connection was successful, you will see the Edmodo Sign in feature set to ON, and your Edmodo email address or username will be listed to the right of the toggle.